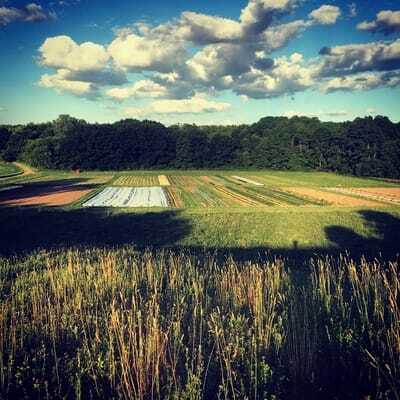 Nestled halfway between Rochester and the Finger Lakes Region, Wild Hill Farm is located on fifty gorgeous acres of prime farmland, all managed completely without chemicals, pesticides, or GMOs. 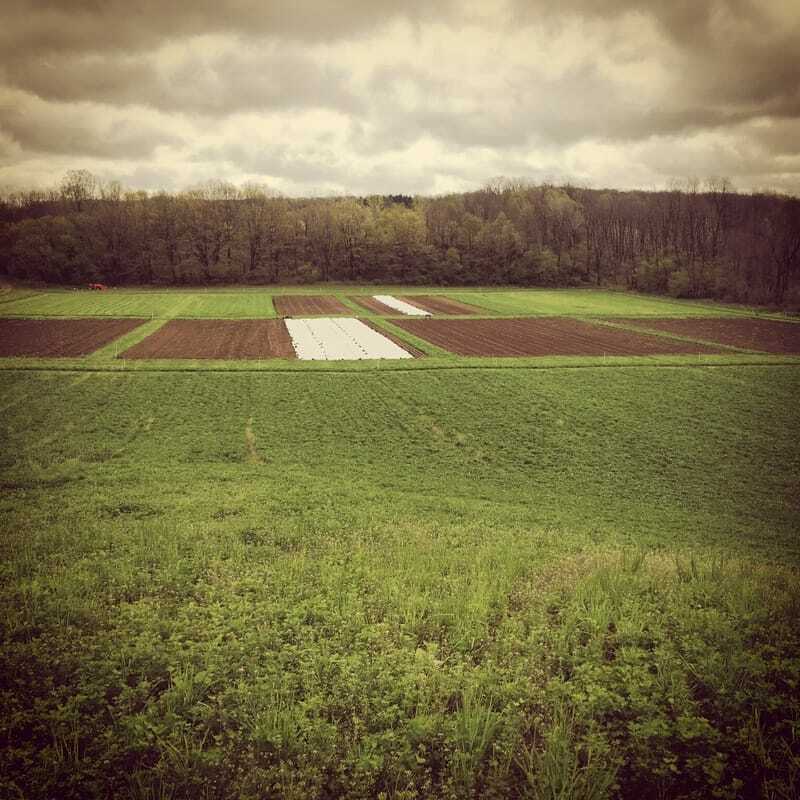 Twenty of these acres are perfectly flat, where we rotate our 4-5 acres of vegetables through a long-term cover crop rotation. The hilly parts of the farm are planted to hay right now, and we might someday integrate pasture-based animals into the mix. Also we'll be planting a few acres of fruit soon too! Did we mention that we're less than a 30 minute drive from downtown Rochester? When we say the farm is in Bloomfield, we actually mean it's in Ionia, a tiny hamlet of about 80 households inside Bloomfield borders. Most people don't know about Ionia (I didn't and I grew up twelve miles away! ), but those that do appreciate its rich agricultural history and quaint village life. 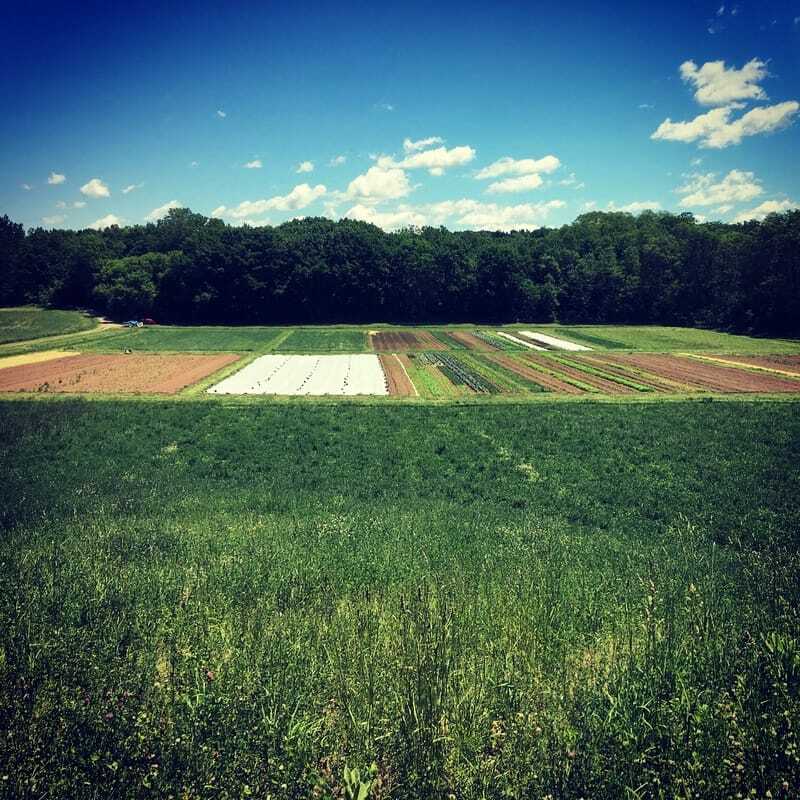 Geologically, we're in a special area formed by glacial deposits of sand and gravel, which give the shape of our rolling hills, and also the well-drained soils that are so perfect for growing vegetables and fruit. We are at the meeting point of three different watersheds, and there are springs in the area which flow in all directions, becoming eventually Irondequoit Bay, the Finger Lakes, and the Genesee River. From 1853 to 1939 a railroad line went right through Ionia, deemed the "Peanut Line" because of its diminutive size, apparently. It served to haul produce to Buffalo and New York City, including crops like cabbage, cucumbers, potatoes, apples, peaches, and of course: Asparagus. Hence the name given to the railroad depot here: "Asparagus Junction"! These days, two large vegetable farms have been operating in Ionia for generations: the White farm, and the Schlenker farm. They grow hundreds of acres of cabbage, squash, and sweet corn. Besides the fertile soil, friendly neighbors, and daily tractor traffic down our main streets, what I love about Ionia is that I can drive a half hour to see my friends in the city, or drive a half hour to be in the beautiful Finger Lakes region. Most of the time, however, I just enjoy being in the fields, surrounded by woods, fields, and farmsteads, watching red-tailed hawks circle the sky. 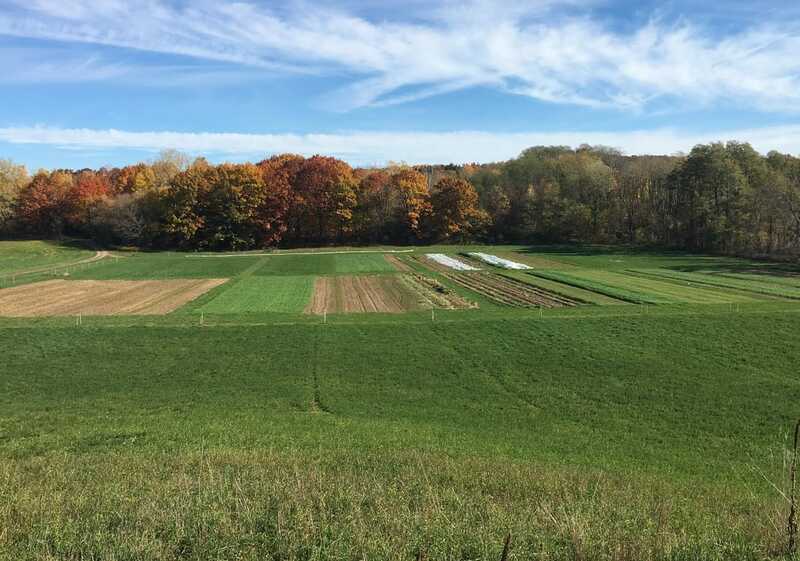 Wild Hill Farm (a total of 128 acres of woods and fields) has been permanently protected from development through a conservation easement with the Genesee Land Trust. This means the land can never be subdivided, and there can never be houses built on these fertile fields. This is a very important legal move, and a rare chance for a farm to be around forever and ever. We are grateful to our landowner, Henry Stebbins, for taking this step, as well as for signing a 20-year lease with us. 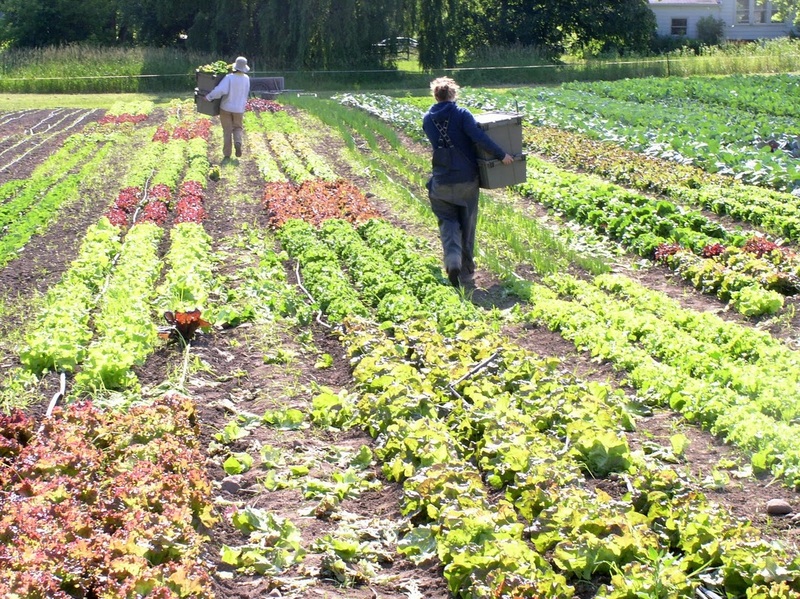 Ionia has historically been a community of small farms, but times are changing; Ionia now sits at the edge of urban sprawl, which threatens to destroy the agrarian quality of life that characterizes this place. It’s well documented how farms and farmland fall prey to the incursions of sprawl. Farmland is just wide-open space susceptible, without protection, to irresistible forces associated with development. Typically, it begins by bits and pieces in leap-frog-fashion. Over time farmland values inflate beyond what a farmer can afford, farm numbers decline as the land base diminishes, support services relocate and ultimately there is a point of no return: no farms, no farmers, no agricultural infrastructure, and just vestiges of the past, if any. 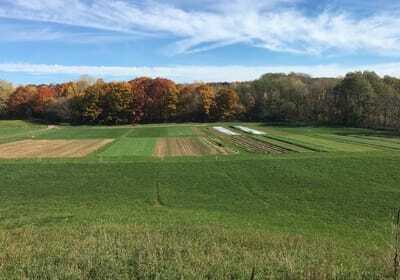 There are strategies and planning techniques that are useful but none ensure lasting protection of the land – with the exception of Conservation Easements. It is the only antidote to counteract sprawl. A conservation easement is a recorded land use agreement in which the landowner (grantor) conveys to a qualified organization (grantee) certain rights that will serve to permanently protect the identified attributes of the eased property. The process begins with the landowner and prospective easement holder, usually a land trust, identifying appropriate rights and restrictions on the use of the land, including a prohibition against subdividing the land for development. Upon agreeing to the terms, the owner conveys the easement to the designated land trust. The landowner retains title to the land itself and continues to use or lease the land in accordance with the terms agreed upon. As holder of the easement, the land trust will visit the land annually, as part of its responsibility for assuring that the terms and conditions are met. 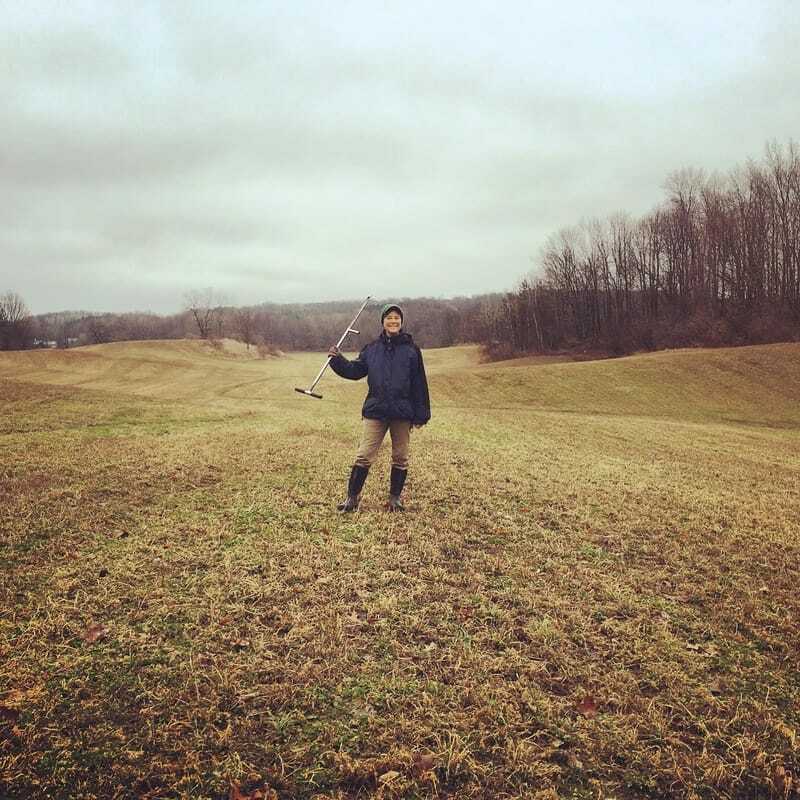 On December 30, 2016, Henry Stebbins, as grantor, conveyed a conservation easement over his farm to the Genesee Land Trust, the grantee, ensuring that his land, which I lease under the name “Wild Hill Farm” will always remain available for farming. I share Henry’s vision for a future that includes fresh food, scenic open space, and a continuing agricultural heritage in this region for generations to come, and I am proud to be farming land that is a part of that future. I urge everyone who enjoys their trips to Wild Hill Farm and the vegetables we grow to support the use of conservation easements. You can find out how by visiting http://www.geneseelandtrust.org. Hi everyone, it's Farmer Erin! I have been making my living as a vegetable farmer for over ten years now, and I love every day of it. I grew up in Fairport, NY, got a degree in Landscape Architecture at Cornell University, lived in San Francisco for five years, and ran my own landscaping business, all before finally getting myself onto a farm. When I did, I was amazed at how well the career and lifestyle fit me. I apprenticed for a year at﻿ Full Belly Farm﻿, a large organic farm near Sacramento, California, which grows everything from veggies to fruit to flowers to sheep. I learned all the farm basics: how to drive a tractor, how to milk a cow, how to speak Spanglish, and how to irrigate crops. This farm grew food for a 1,300 members in the Bay Area, and supplied Whole Foods and many high-end restaurants. After so many years in that hot, dry climate, I started missing the distinct seasons we have here in the Northeast, the autumn colors, the miraculous springs. So I decided to move back to my hometown and start a farm. But first I had to learn how to grow vegetables in the Northeastern climate -- very different from California! 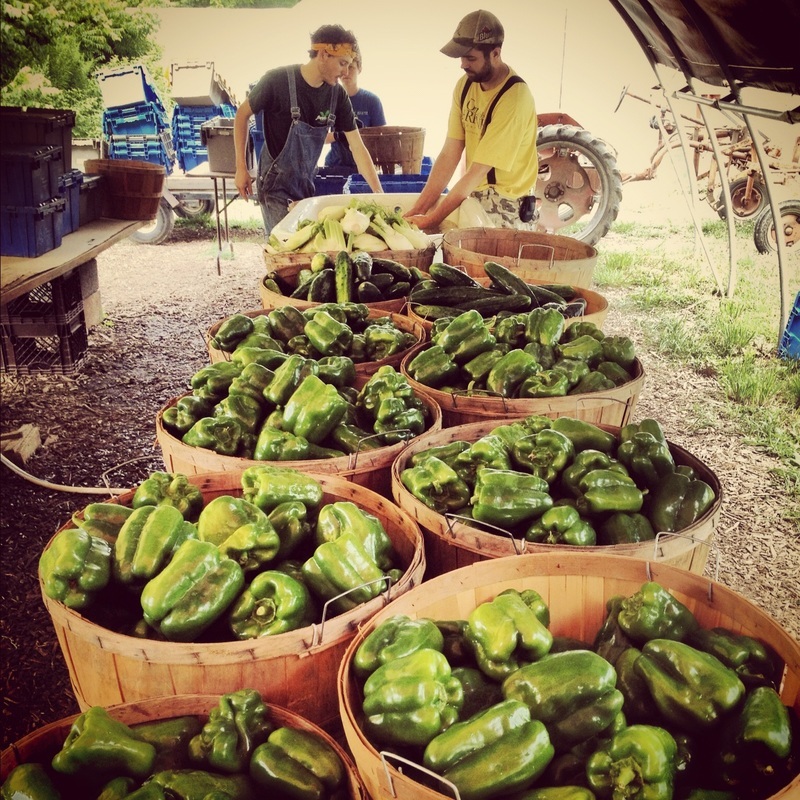 So I spent another season apprenticing at Sisters Hill Farm, in Stanfordville, NY (Hudson Valley). I fell in love with the small community feel of a 200-member farm. Farmer Dave Hambleton was an incredible mentor, and gave me the encouragement I needed to start my own farm in the Rochester area, Mud Creek Farm. Launched in Victor in 2009, Mud Creek Farm was a synthesis of all the lessons I'd learned in growing things: horticulture, permaculture, biodynamics, ecology, community gardening, and yes, landscape architecture. 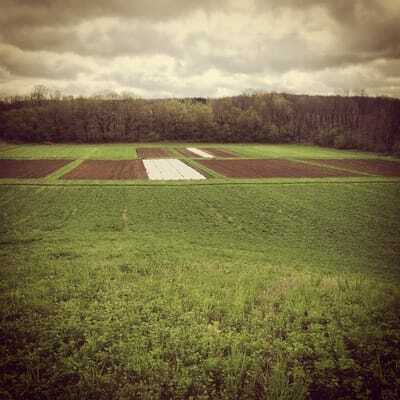 I rented a field in Victor, NY, and started a farm from scratch. With the help of my parents and friends, we rounded up 80 members the first year, and grew and grew, with a waiting list every year. By 2013 we had 400 members! I had an assistant farm manager, a greenhouse manager, four tractors, and an awesome crew. We were growing amazing beautiful vegetables using only organic techniques for so many people in the community, and everyone picked up their shares right on the farm, and we had a lovely U-Pick garden. It was an incredibly satisfying job, and even was meeting my goal of being financially sustainable! Sometimes our path in life is not straightforward. After 5 years of building up the successful Mud Creek Farm operation, my wild heart pulled me elsewhere. I passed the farm business on to my dear friend and assistant manager, Ruth Blackwell. She was more than qualified, and felt ready to take over ownership, and make Mud Creek Farm her own. It was a tough decision, but I knew that I always had the ability to create another farm. And she has done an amazing job in the last couple of years continuing the spirit that I had nurtured and begun there in Victor. I learned a lot from the process of letting go, and I got the chance to travel a bit and re-center. In 2015 I decided that I still loved the Rochester area dearly. I moved back, and before settling on my new piece of land, helped a local non-profit launch a therapeutic farming program for Veterans, creating a 3-acre organic farm out of a hay field. I continue to teach "Growing Food 101" classes to Veterans and mentor farm apprentices there. Wild Hill Farm is my third farm created "from scratch"... launched in 2016 with 70 members. Over the last 3 years, we've grown the farm to about 200 families, as that's a size that allows me to work closely with a few beginning farm apprentices, get to know all the people I'm feeding, and support me financially. I plan on growing more fruit in the future, and hosting more barn dances! My mission continues: To nourish and strengthen our community, to responsibly steward the land, and to help build a new agrarian movement aimed toward re-connection and healing. Hope you can be a part of it. 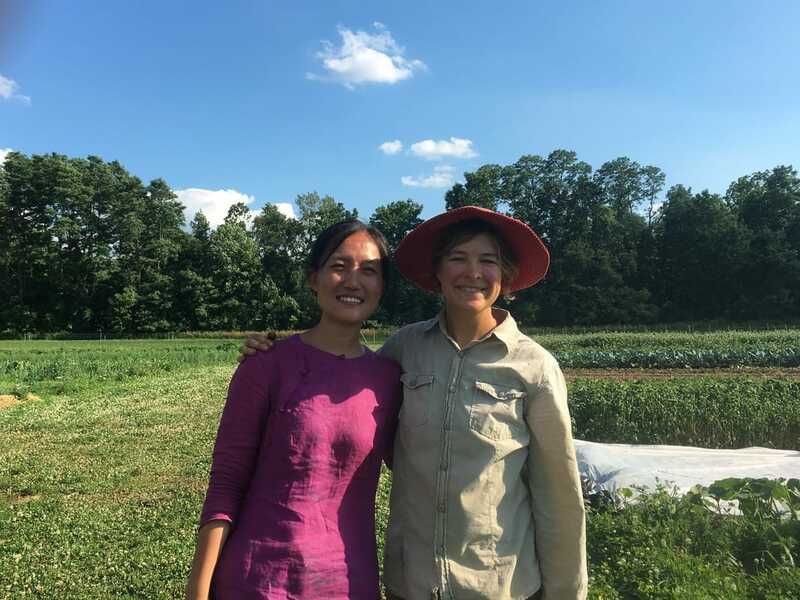 Wild Hill Farm got a visit from Shi Yan of Shared Harvest Farm this summer-- she's the first CSA farmer in China! I got to see her farm in Beijing a few years ago... they have over 600 farm members!